Today was the fourth and final day of Delhi Mandir Rajat Pratishtha Mahotsav. Shree Ghanshyam Maharaj was adorned with beautifully ornate chains of gold, and pearl and violet garlands and shawls. During mangla aarti, Shree Ghanshyam Maharaj, Jeevanpran Abjibapashree and Shree Muktajeevan Swamibapa cast their divine gaze over all the disciples that had eagerly gathered to celebrate the twenty-fifth anniversary of the installation of the murtis of Lord Swaminarayanbapa Swamibapa by our beloved Gurudev Shree Muktajeevan Swamibapa in Delhi Mandir. Following mangla aarti, the temple hall was filled with the sounds of the prabhatiya kirtans written by the Nand padvi Sants. 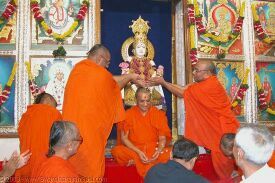 The patotsav ceremony was conducted by His Divine Holiness Acharya Swamishree. The Lord was ceremonially bathed with the five nectars. The Jan Mangal Stotra was then recited, while Acharya Swamishree placed a gold and silver flower and the lotus feet of Shree Ghanshyam Maharaj. Conceding to the humble requests of the sants and devotees, Acharya Swamishree then allowed them all to perform abhishek to Him, using the precious flowers. Everyone in turn was given the opportunity to shower our beloved Param Pujya Acharya Swamishree with the gold and silver flowers and petals. This rare opportunity made the concluding event of the Mahotsav an unforgettable moment in the lives of all the disciples. The divine ashirwad of Jeevanpran Swamibapa has heard after which the Mahants of Shree Swaminarayan Temple Delhi, Shree Dharmanandandasji Swami and Shree Dharmaswaroopdasji Swami presented a souvenir shield to Acharya Swamishree. Because without Him, the Mahotsav would have been an impossibility. Acharya Swamishree presented souvenirs of the mahotsav to disciples. A vast array of food was then offered to the Lord in the form of an annakut. His Divine Holiness Acharya Swamishree performed the first aarti, after which many disciples were also given the opportunity to offer their devotion in the form of aartis to the supreme Lord. Finally, everyone was given prasad from the annakut, and everyone departed for their homes, with sweet memories of this unforgettable Mahotsav.